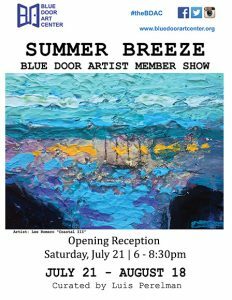 Join us for the opening reception of Summer Breeze on Saturday, July 21, 6 – 8:30pm at the Blue Door Art Center. This show is a summer showcase for our local Artist Members some of who are experienced artists and some debuting their work. The show is curated by Blue Door executive director, Luis Perelman and featured as a wide variety of mediums. See the work, meet the artists, wine and cheese, all welcome! This entry was posted in Press Releases and tagged artists, exhitibt, opening reception. Bookmark the permalink.